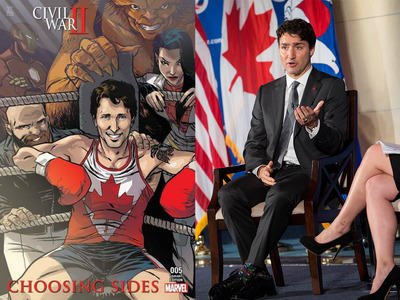 Marvel Comics/Drew Angerer/Getty ImagesPrime Minister Justin Trudeau on the cover of a Marvel comic. Canadian prime minister (and Internet heartthrob) Justin Trudeau is now a character in the Marvel Universe. The 44-year-old politician is set to appear on an upcoming variant cover of a Marvel comic book, issue No. 5 of the “Civil War II: Choosing Sides” limited series. Trudeau, sporting maple leaf boxing attire, is depicted resting in a ring alongside Puck, Sasquatch and Aurora, all of whom are members of the Canadian superhero group Alpha Flight. “I didn’t want to do a stuffy cover — just like a suit and tie — put his likeness on the cover and call it a day,” Toronto-based artist Ramon Perez explained, according to CBC News. The series, “Civil War II: Choosing Sides,” is a tie-in to a big event where Marvel heroes are fighting over the implications of a new character who can predict the future, “Minority Report”-style. War Machine and, presumably, She-Hulk have already been killed. 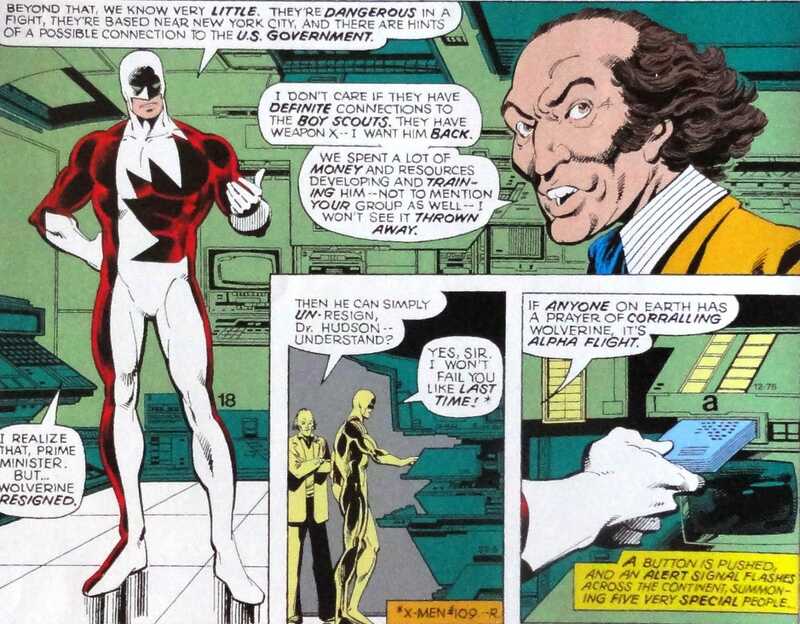 In the issue that Trudeau appears in, the heroes of Alpha Flight are debating which side they’re on. The cover isn’t the first time that a Trudeau has been in a Marvel Comic. His father, Prime Minister Pierre Trudeau, appeared as a character in the series “Uncanny X-Men” back in 1979. Marvel ComicsJustin Trudeau’s father, Prime Minister Pierre Trudeau, also appeared in Marvel comics. The new comic was written by Canadian comics writer and artist Chip Zdarsky, who said he instantly knew he wanted to include Trudea in the comic. He reportedly reached out to the prime ministers’ office before going ahead with the cameo, and while they said they couldn’t officially endorse it, they were cool with the superheroics. 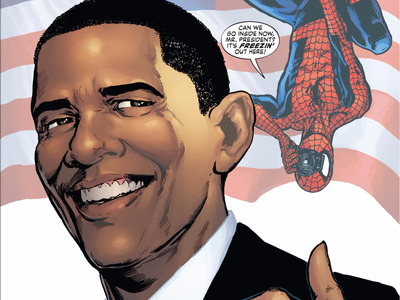 Marvel ComicsPresident Barack Obama and Spider-Man. Issue No. 5 of Marvel’s “Civil War II: Choosing Sides,” is set to come out on August 31.